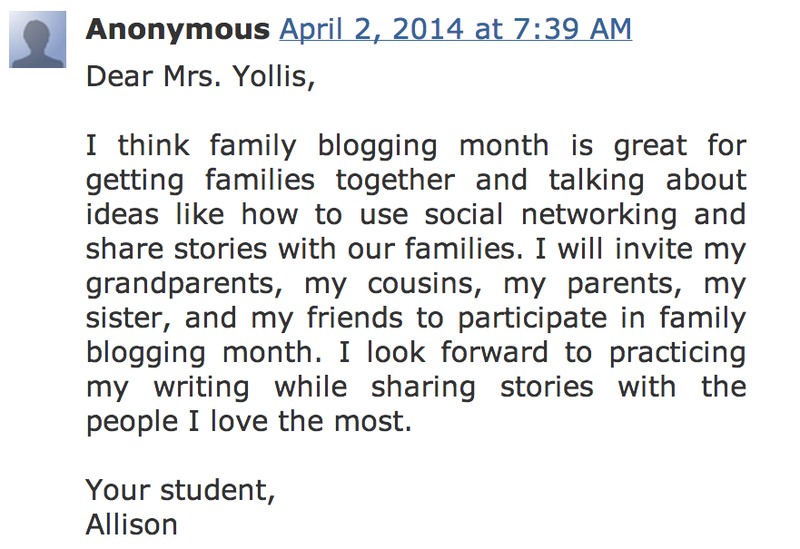 April is Family Blogging Month in Mrs. Yollis' classroom. This event helps to promote blogging and brings all family members into our online learning community. Since this month includes family holidays and a one week Spring Break, it is the perfect time to share and learn together. Each year, the comments get better and better. This month, we've gotten so many comments we could not read them all in class! In this post, I am highlighting some of the fabulous ways that parents, grandparents, and extended family have shared! I appreciate all the "Virtual Volunteers" who help comment and reply to my student bloggers. The original post has nearly 100 comments! I encourage everyone to explore the manifold of comments. Family Blogging Month starts with an invitation to join our blogging community! I am exceedingly proud of our online community and appreciate all the contributions! "It is so important to learn the etiquette of the internet and how to be safe in the cyber-world. You are learning life-long, valuable lessons from Mrs. Yollis. I am a pediatrician and I always talk to my older patients about internet safety. I tell them that the internet is much like the real world in that you should never talk to strangers. I remind my patients not to post what they look like, where they live or where they go to school. I am so glad that you and your friends are learning to be safe." "Today, in class, Mrs. Yollis told us that we would be nominating other students that have been leaving quality comments. At that time, I thought I know a lot of tips on leaving quality comments. I should share my tips. So, that's what I am going to do right now. 1. Compliment the writer. Some people think that complimenting can just be saying that something they wrote or wrote about was really fun to read. Yes, it is complimenting, but it's not specific. You can name the specific thing that made your eyes stick to the computer. 2. Add new information. Pretend you're replying to your friend who likes writing about his two dogs. Let's say he took the time to write a whole step-up-to-writing paragraph. He probably put a lot of effort into that comment. You can add some new information to guarantee a reply." "I have been commenting on my classmate's blogs and find that starting off by complimenting them on their idea and thanking them for sharing is a great way to start! I think you are all great commenters but one type I have learned about commenting that I would share is something I learned this year:spacing and length of comments are important. Try not to make comments too long- and be sure to space them out." I concur! Spacing out a comment is very important. If you leave it too long, readers might get tired and start loosing interest. If you leave it too short, readers will have less to compliment or to ask about. Unless you're writing a story, you should try to keep it in the middle. " "There was an interesting slide outlining 10 reasons why kids should blog. I have summarized the reasons below. Can anyone else think of other reasons in addition to the 10 below? Blogging is a very good resource that helps you develop your writing skills. Blogging feels like you are writing a book, but it's really just one long page. Blogging helps you leave quality comments and your writing gets better. Blogging charges your brain. Blogging expands your knowledge in all the things in the world, and most importantly, it helps you connect with other people and share." "We can solve problems when we journal, because we see our problems clearly after we’ve written about them. In blogging, we can also get help with our problems from our friends, family and teachers." "Know yourself better. By writing routinely you will get to know what makes you feel happy and confident. You will also become clear about important … information for your emotional well-being." "Ok, so here's what happened when I went to Zimbabwe. I wanted to fly to Zimbabwe on Thursday, February 20th where the flight would arrive on Friday night February 21st. Then, I was supposed to have a meeting at 10 AM on Saturday, February 22nd, which is really 3 AM for me since my body was still on Maryland time. But, the good news is that I would have the rest of Saturday and all day Sunday to rest and make final preparations for my work, which would begin on Monday, February 24rh. Well, a funny (actually not so funny) thing happened to me at the airport in Atlanta. First, to let you know the flights, I had to fly from Baltimore, Maryland to Atlanta, Georgia in the morning, which is a pretty short flight -- about 2 hours. From Atlanta to Johannesburg, South Africa, the flight is 17 hours -- non-stop. Let me run this by you again, so you'll appreciate this -- I'm talking about sitting in one airplane chair for SEVENTEEN HOURS straight from Atlanta to Johannesburg, South Africa (now you can see why I said that the flight from Baltimore to Atlanta was "SHORT", since it was only 2 hours. Then, after a 4 hour layover in Johannesburg, South Africa, I took another final flight to Harare, Zimbabwe (Harare is the capital of Zimbabwe -- pronounced, "Huh-rah'-rey"). So we're talking about over 30 hours total of flying and waiting for connecting flights before I actually get to Zimbabwe when the flight arrived at 9:15 PM. Maybe you should look at a globe with your classmates and teacher to see where Johannesburg, South Africa is and where Harare, Zimbabwe is -- it is REALLY FAR AWAY FROM THE UNITED STATES!" "You already know that I travel all around the world for my work. Sometimes I have traveled to countries during Passover. In 1977, I worked in a tiny country called Lesotho, which is located in southern Africa where I attended a Passover Seder at an Israeli family's home, who were working in Lesotho the same time I was there. Can you find Lesotho on a map of the world?" 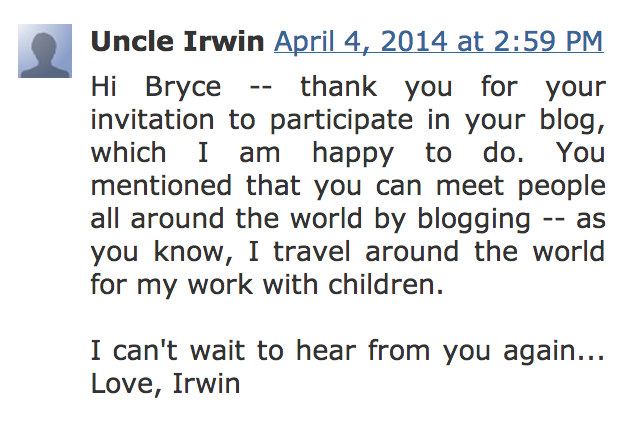 "It's so nice that you are doing family blogging month this year as well. It looks like Family Blogging Month is getting very competitive. You have a lot of participation and great comments. I will never forget all of the great memories from being in your class in 2011. Maybe you should have a separate category for your former students. It would be very nice to see how many students would comment. I recently won an award for the highest score in the class in writing. A lot of that credit should go to you for teaching me how to write and to blog. " "In my opinion, you are exceptional in English! How many years did you learn English? I know that Theo has a little sister in first grade, but I never knew that Theo had a older sister. What grade is she in? In my family, we have two children. There is my brother and me. All of my grandparents are in China, presently, and one of my cousins is in China. My other cousin is in California, and she lives about an hour away from here. I am the youngest child in my whole generation so far, and I don't really like being the youngest." Thanks for your message and your kind words about my English. Indeed, my wife Aurelie and I love to travel. In 2001, before we had kids, we traveled the world with our backpacks for 6 months. We visited South America, Australia, New Zealand, Vietnam and Cambodia, that was awesome! This experience has encouraged us to keep discovering new countries as much as we could. A great thing about traveling is summarized in a word I love:serendipity. Have you ever heard this word? It means when you are putting efforts into discovering something, you will sometimes discover something you did not expect, often much greater than what you were looking for... That is what traveling is all about." Your great- grandfather (and my father) Dave Barry was born in the Latvian shtetl (village) of Dankere in 1888. His original name was Dov Bear ben (son of) Kasriel. When the family emigrated from Latvia in the first decade of the 20th Century (there had been pogroms (riots) against the Jews) he anglicized his name to Dave Barry and for a last name he chose the name of the village where he had been born. The family emigrated to England. Dave's father Kasriel was a cabinet maker and worked for a while in Cardiff in Wales. Although most of the family lived in Manchester, a sister, Sadie travelled to the United States and met and married Nathan . She set up a home on the west side of Chicago." I am David, Jemma's uncle. About five years ago I decided to embark on a open water swim in the ocean. This particular swim is from Alcatraz prison to the shore of the San Francisco bay. It is a 1.5 mile swim. People from all over the world travel to San Francisco so that they can compete in this swim. This endeavor is particularly difficult in that one has to cope with very cold water temperatures usually ranging between 57 and 62 degrees. The other challenging part is that there are very strong currents and if one is not careful the currents can pull you way off the course. Before the race begins the race supervisor informs us of the days current and what we should aim for on race day. Most people attempt the race wearing a wetsuit, as this keeps the body warmer. It is also not uncommon for a seal to pop up in front of you and say hi. In addition there are supposedly baby sharks swimming below. When you complete the swim you will receive a very impressive medal. " I am Darius' nana, and I work at The Metropolitan Museum of Art in New York City. 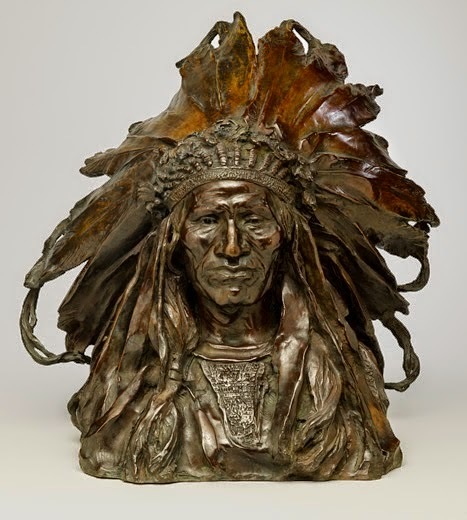 I know that the class is studying about Native Americans and I thought you might like to see some bronze sculptures from an exhibition that is now showing at the museum. It is named “The American West”. The first picture shows the head of Chief Blackbird of the Oglala Sioux tribe, one of seven tribes that make up the Great Sioux nation, and many still live today in South Dakota. "Several years ago, my husband and I went on an adventure. We drove up to Connecticut and went for a ride in a hot air balloon! It was so exciting! It was autumn, and the colors of the trees were so beautiful. We leaned over the gondola and noticed that the shadow of the hot air balloon was showing on the trees so we took this picture. The ride took about an hour and it was very peaceful and quiet up there, floating above the houses and trees. What a fascinating experience it was! We landed safely in an alfalfa field. How high up do you think we went? Bryce’s Grandma in New York"
Nate's father contributed a photo, Clare's mother joined in with a Georgie photo, and many more on our Class 365 Blog. Teachers, here is some information about running your own Family Blogging Month. Everyone, here is some information about contributing to our Photo-of-the-Day blog. What did you learn from the comment contributions? What value do you see in Family Blogging Month? I love what you do with Family Blogging Month! I think you inspire families to talk to each other about things they might not regularly speak about. These posts build connections between your students and give them incredible memories of 3rd grade. Because of your amazing capacity to inspire students and teachers to be their best, I have nominated you as the Elementary Educator of the Year award with the Bammy Awards. Wow! I am honored that you would nominate me for a Bammy Award! I am passionate about blogging and building an online learning community that includes students, their parents, and the world. This Family Blogging Month project continues to exceed my expectation. Clearly, when everyone contributes and works together, we all win! 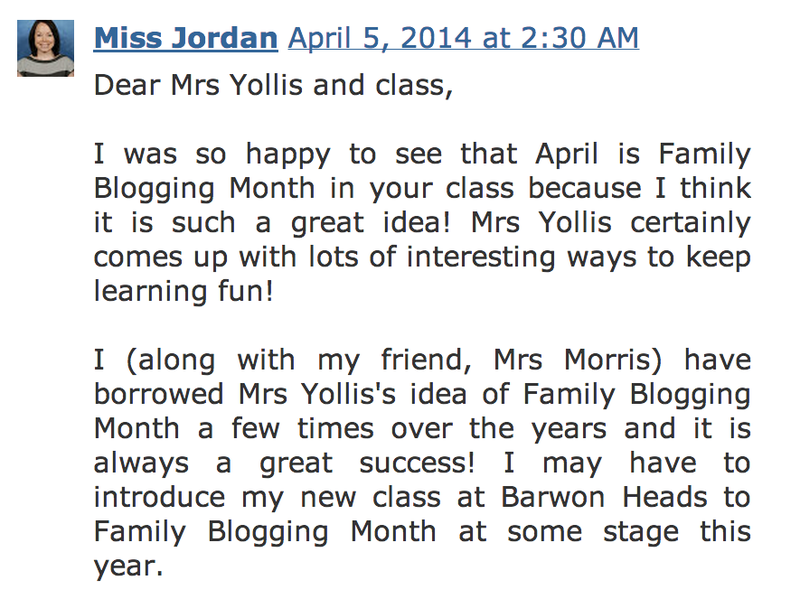 Family Blogging Month is such a brilliant idea and just like Miss Jordan in Australia, we are looking at my school at creating our own version of this as inspired by your work. The quality of the comments and the feedback that you have generated as always is breathtaking. Such variation - but what an amazing lesson for your students and audience. Congratulations on your nominations from Mrs Hembree - and I am not surprised. You have won many awards (only some that I am aware of I am sure, is there a list anywhere of the full list?) but when I asked about blogging and examples I always come back to refer people to this site and your work. Another outstanding example of your work. Thank you for your thoughtful comment! I have thoroughly enjoyed every Family Blogging Month that I have run. It is a wonderful way to bring family and friends into the learning community. Learning together and having that support makes all the difference! I am honored that Mrs. Hembree would nominate me for a Bammy Award! Her nomination and kind words fill me with pride! Although not everyone agrees with awards, these types of programs help promote educational blogging and bring attention to projects that enhance student learning. Thanks for being a part of our learning community, Mr. Webb! Congratulations for your nomination of Bammy Awards! You have done so much on building the virtual learning community. Family Blogging Month is such a good way to get students and families involved in blogging and therefore motivate students to write for a real purpose. It is more interesting to write for real audience than to write for grading. Mrs. Yolllis told us to introduce ourselves, so I will. My name is Bubbe and I am Bryce's great grandmother. In Yiddish the word "Bubbe" means grandmother, but Zayde, your great grandfather and I decided we would like to be called by these Yiddish names. I will be 92 years old in May. I was born in Woonsocket, Rhode Island. I wasn't born in a hospital. I was born in my own house. I went to school in Woonsocket and met Zayde and married him there. We didn't move to California until I was 85. We moved in with Gaga and Papa. The best part of living here is all the time I get to spend with you, Mommy, Daddy and Hunter. My favorite time with you is when you, Edna and I watch Jeopardy and Wheel of Fortune together. What are your favorite times, Bryce? What would you like to know about the past 92 years? If you ask, I'll answer. Thank you so much for visiting our blog and for leaving such an outstanding comment! You are our first nonagenarian! (non·a·ge·nar·i·an) Welcome! How fortunate for the family that you are able to live near one another and spend time together. Family time is special! You mentioned that you would answer questions. I have a few questions. Who was president when you were born? What was school like when you were in third grade? Looking forward to blogging and learning with you! Thank you for your warm reception. It is nice to be a part of Bryce's school activities. Thank you also for the new word "nonagenarian." I'm never too old to learn. When I was in third grade, I went to Pothier School on Social Street in Woonsocket, Rhode Island. My third grade teacher was Miss Cilcline. I don't remember exactly what I learned. I was told that I had very good penmanship and I loved to learn. I was glad that I could pass that feeling on to my children, Ellen and Irwin. Everyday I walked home from school for lunch. Then I walked back for the afternoon. Then I walked home again. I was very lucky to live in a house. In my backyard was my father's horse Yankee. He was almost red in color. Everyday my father would take his horse and cart and go out and buy and sell rags. I guess he did very well, because he was able to buy his first car in 1926. It was a Buick. Warren G. Harding was the president when I was born. I have lived through 16 presidents. I plan to be around for the seventeenth, too. I knew that Warren G. Harding was the president, but I didn't know about the 16 until we had dinner one night and Bryce played a President's game with us. He knew them all and he told me that there were 16 since I was born. I love living with and near my family. You are right. Family time is special. I can't wait to blog again. I learned to type when I was in Junior High School. We didn't have typing in the third grade, like Bryce does. Next time I will tell you more about life in Woonsocket. I'll answer any other questions too. I remembered one more thing about school. We didn't use ball point pens or computers. We had pens with tips on them and we dipped them in inkwells on our desk. We had to be very careful not to smear the ink. If I remember more, I'll write more. 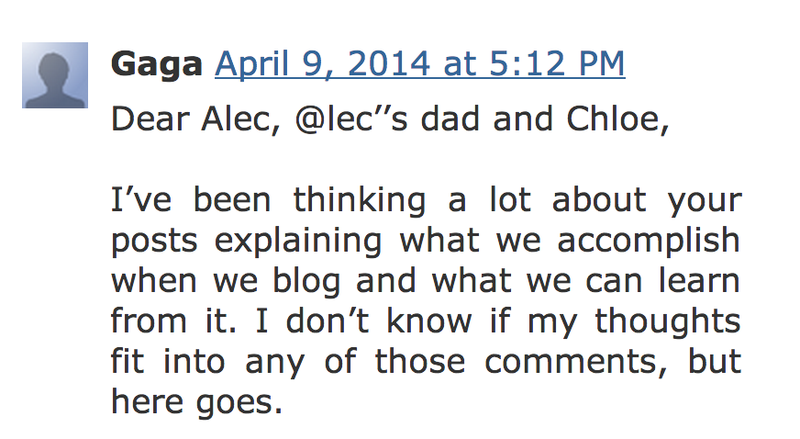 I concur that Family Blogging Month is a great method to get families and friends sharing facts and opinions. Wow! On the 365 and classroom blog, we are hearing from so many people all over the world. Parents, grandparents, cousins, siblings, you name it! To me, blogging plays a big part in becoming a great writer. What an awesome project! 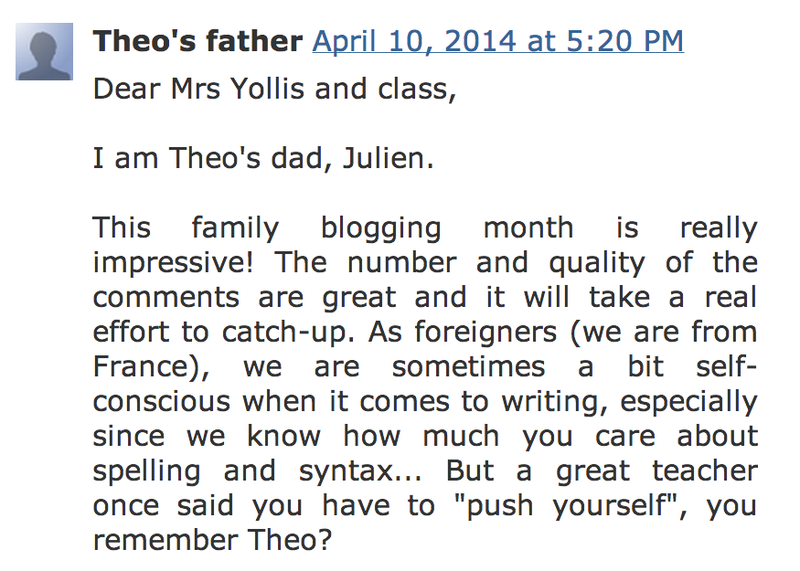 I love how your class is using blogging as a way to communicate with the family community. It is an amazing project Will and if you are going to endorse it that is high praise indeed. Have you and Mrs Yollis ever met? No, I have never met Mr. Chamberlain in person. One day, I hope that I will! You are probably on your way to the airport for your trip to New York. I hope you and Hunter have a great time and enjoy seeing your cousins. Please say hi to Jenna, Jocelyn, Leslie, and Mike for me. Let them know we have a Disney Cruise coming up soon and it would be neat if they could join us again. Do you know what your plans are for each day of your visit? Don’t forget to have some Long Island pizza! Best pizzas outside of Brooklyn. How was baseball practice last night? Did you try fielding and hitting? How did you do without the boot? Will the team have enough players for Saturday’s game? I can’t wait to be back in the dugout next week and have you back in the lineup. Go Red Sox! How was the Kings game last night? Too bad they couldn’t hold on to the leads they had and they lost in OT. I think they are toast for this postseason. Let’s make sure we do Face Time with each other while you are in New York. I can’t wait a whole week without seeing your smiling face (and Hunter’s and mommies and daddies also). Let’s do the Face Time when everyone is around so I can say hi to them. Have a great time in New York. I will see you Monday after school. What a wonderful blog we have! Many people have contributed to your blog. What encouraged you to start your own blog? What encouraged me to blog is the opportunity to have a nice time communicating with others. If I was Shayna I would be very proud of myself for using correct grammar,nice punctuation, and giving us some great information about technology . I look forward to commenting more about other spectacular subjects. I share your opinion about our blog. It is a wonderful space! You asked what encouraged me to start the blog. I thought that having a blog would be a great way to share what we are doing in our classroom AND practice our writing skills. I think we have succeeded at both! Today, when my backpack broke, my mom said that this backpack could not last the last month or so. I was thinking, "A month until school ends? Wow! Then Family Blogging Month is a real good way to wrap up the year!" Don't you think so too? Although I appreciate school, I am looking forward to summer break. The school year with you, Mrs. Yollis, seems so short because we are having fun along with learning! I especially like the GoNoOdle activity that we take as Brain Breaks. What part of the school year did you like the most? Thank you for saying that the year seemed short because we are having fun learning. I feel the same way. :-) Maybe for Open House we should do another Trip Down Memory Lane quilt! How many squares will we need? Meet Bubbe, a 92 Year Old Blogger!